Instantly transform your childs bedroom into their own Batcave with the DC Comics Batman Upholstered Twin Headboard from Delta Children. Designed to resemble Batmans mask with its perky bat ears, this sturdy twin headboard is upholstered in cruelty-free faux leather and features bold graphics of the Gotham City skyline. 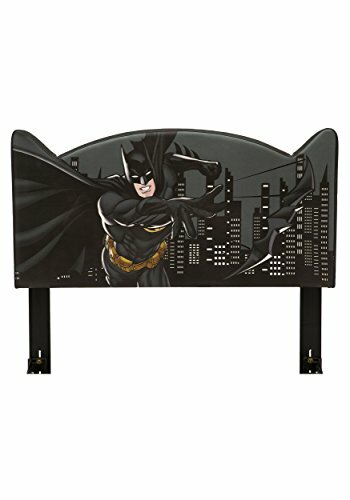 So be a superhero and get this Batman Upholstered Twin Headboard from Delta Children for the DC Comics fanatic in your life. The headboard easily attaches to a standard metal bed frame (sold separately) and works with a twin size mattress (also sold separately). About Batman: Dark Knight. Caped Crusader. Sworn protector of Gotham City. Batman goes by many names, but he has only one missionbecome the worlds greatest weapon against crime. His powers? Super-sophisticated gear and intelligence. Batmans utility belt and Batmoblie help him morph him into the ultimate vigilante. Made to KA-POW, Batman furniture and home decor from Delta Children add cool style to your any space while creating a fun crime-fighting ambiance that's perfect for pretend play.